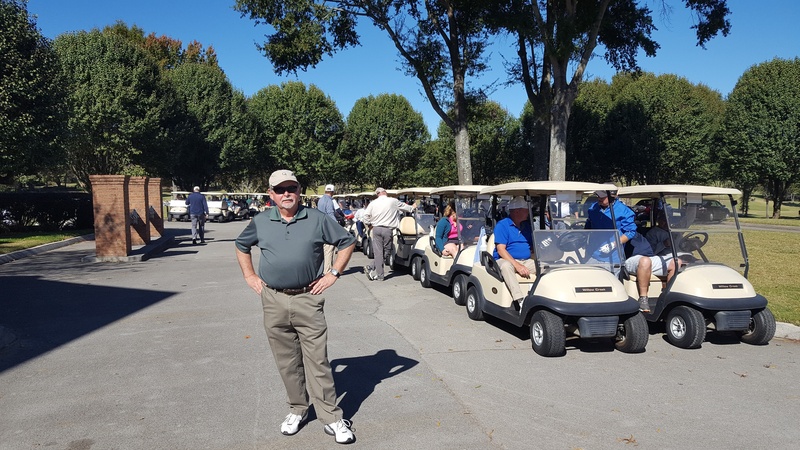 CSI Knoxville held its 15th Annual Golf Tournament at Willow Creek on Monday, October 29, 2018. The weather was PERFECT! We had 19 teams / 75 players On the first Flight - Funderburk Electric came in 1st with a score of 49 and Thyssen Krupp Elevators came in 2nd with a score of 52. On the second Flight - ABC Caulking came in 1st with a score of 57 and Green Valley Farm came in 2nd with a score of 59. With the beautiful weather Monday everyone was a winner! A big THANK YOU goes to Wes Crow who organized the tournament. 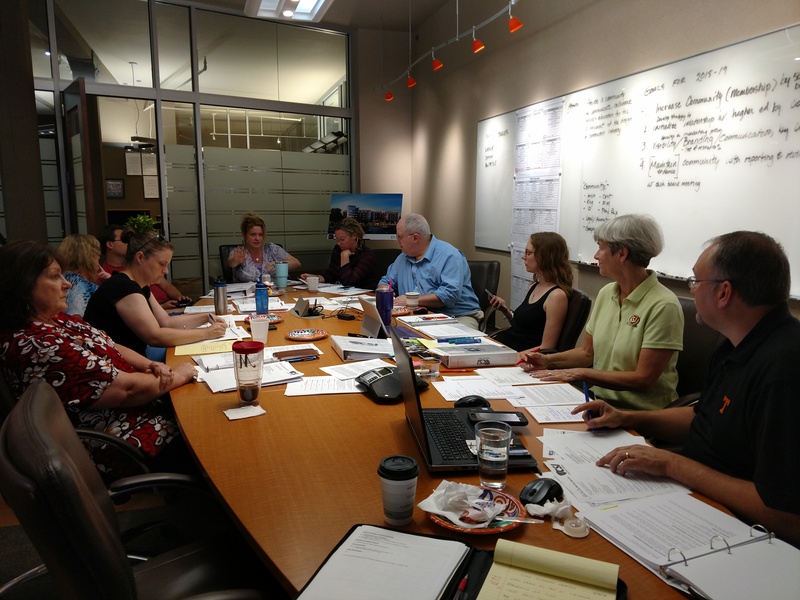 Members of the board and committee chairs met last Saturday morning at CSI President Aaron Miller's offices at DIA to particiate in our annual Knoxville Chapter Planning Retreat. Breakfast was provided by Tyvek and delivered by their wonderful rep Suzan Jordan. YUM! Attending her first planning meeting was newest board member Marni Redmond with Exact Tile. Kathy Proctor facilitiated the discussions as members identified those things that the chapter does well and what things we want to improve in the future. We discussed some opportunities for collaboration with AIA and other organizations. Will Dunklin shared the variety of upcoming programs that will take the member meeting off site to lunch and learn. We will be reviewing the Operating Guide and Bylaws to ensure that they are usable documents. Donna Covert shared that CSI Flash Mobs will be popping up around town after working hours. Whitney Kaul presented teh 2018-19 budget that was edited and adopted. The group refined the mission of the Knoxville Chapter to provide a community to communicate, collaborate, network and educate for the advancement of the design and construction industry. 1.Increase the Community (Membership) by 50% before June 2019. 2.Develop a strategy to initialize relationships with institutions of higher learning by Oct. 2, 2018. 3.Develop a marketing plan that addresses visibility/ branding / Communication by Oct. 2, 2018. 4.Maintain/ enhance the community with reproting and review at each board meeting. What we saw was there are plenty of opportunities for people to get involved and enhance their CSI experience. Watch for the next issue of the Speck to learn more! Josh Brock [General Shale] and John Hockensmith [MHM] put together a first class product show this year at the Crowne Plaza in downtown Knoxville. The show always draws a wonderful mixture of old friends and new ones from the design and construction industry. The sold out show featured new products and services. Registrants were greeted by the Associated Construction Women (ACW) who was gracious to volunteer their services. The new component director for AIA, Dale Powers, was manning the AIA booth to greet visitors also. Knox County Codes department was well represented and was able to talk with lots of designers and builders. The food was fantastic. [we didn't know that shrimp grew that large!!] 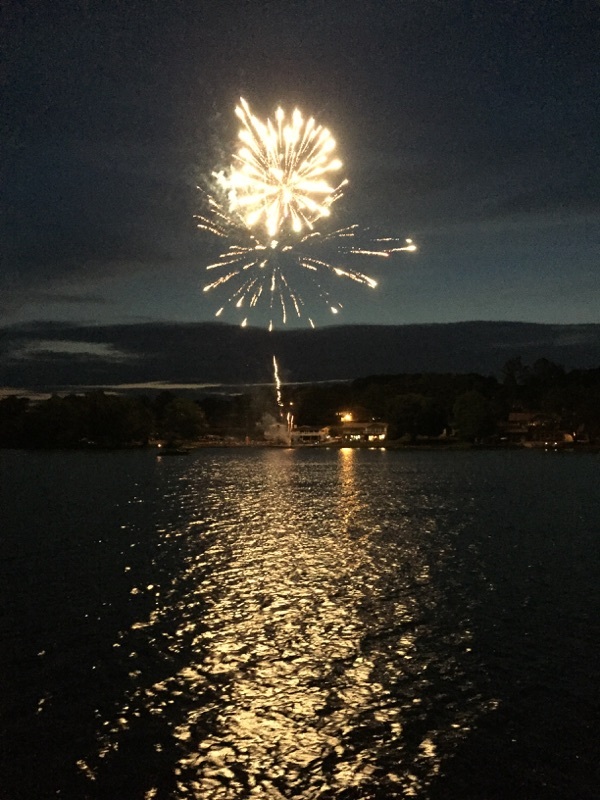 Thank you for all the volunteer efforts and see you again next year. Stacy Colbaugh, CSI, CDT has won the 2016 Region Continuing Publication Award for the excellent Knoxville Chapter publication THE SPECK. 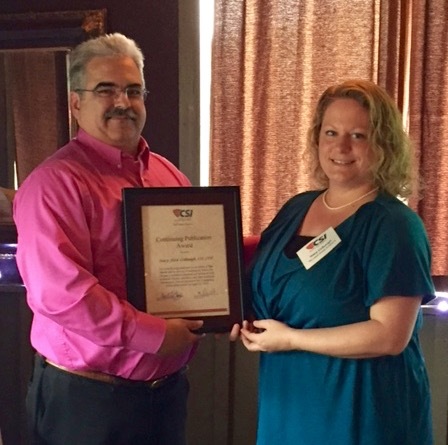 Stacy was not able to be present at the awards ceremony at the Region Conference in Pensacola, Florida so she was presented the award today by President Gary Bergeron at the May chapter luncheon. Stacy has consistently been responsibile for award winning publications since she took over the chair of the Publication committee since "forever". Stacy modestly accepted the award and said that the publication can only be good if the content is good and she depends upon each member of the chapter to send her articles that can be shared with the design and construction community. Thank you Stacy for your hard work to help all of us stay informed about upcoming chapter events and great technical information.